In 1817, the sovereign was introduced, valued at 20 shillings. Struck in 22-carat gold, it contained 113 grains (7.3 g) of gold and replaced the guinea as the standard British gold coin without changing the gold standard. The common currency created in 1707 by Article 16 of the Articles of Union continued in use until decimalisation in 1971. Before decimalisation, there were 20 shillings/pound and 12 pence/shilling, and thus 240 pence/pound. During the Great Recoinage of 1816, the mint was instructed to coin one troy pound (weighing 5760 grains) of standard (0.925 fine) silver into 66 shillings, or its equivalent in other denominations. This effectively set the weight of the shilling, and its subsequent decimal replacement 5 new pence coin, at 87.2727 grains or 5.655 grams from 1816 to 1990, when a new smaller 5p coin was introduced. For nearly a century, the South African pound was equal to a British pound, which equalled 7.3 grams of gold or 113.1 grams of silver. Money was clearly defined. Everyone knew what the value of money was. It was a certain weight of gold. 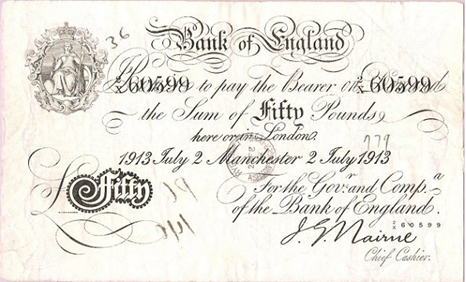 Because the value of money was transparent and widely understood, private banks issued bank notes to any member of the public depositing British pounds or gold or silver in their vaults. Bank of England Bank Note - "Promise to pay the bearer on demand the sum of fifty pounds here or in London. 1913 July 2 Manchester." It was the legal certificate which showed that you owned money. The same counts for the South African pound. Private banks issued bank notes freely, to the extent that they had gold in their vaults to make good on its “Promise to pay” in money. Below is an example of The Standard Bank of South Africa Ltd 10 shillings bank note, which “Promise[d] to pay the bearer on demand at the [Standard Bank] office of Durban, 10 shillings,” or the equivalent of 56.55 grams of silver or 3.65 grams of gold. It was a contract that even a five year old could understand. 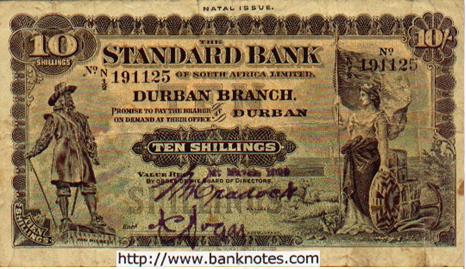 Standard Bank Ten Shillings - "Promise to pay the bearer on demand at their office in Durban, TEN SHILLINGS." SARB - "I promise to pay the bearer on demand at Pretoria, FIVE POUNDS." 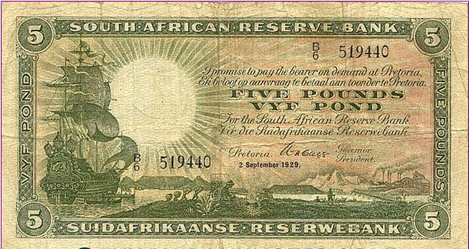 The South African pound was for over a century, from 1825 to 1961, linked to the value of the pound sterling. The pound sterling, in turn, was for most of this time linked to a certain weight of gold or silver. The South Africa pound was through the link to the British pound, not only as good as gold, it was gold. So where does the Reserve Bank come in? South Africa never had a central bank until the creation of the South African Reserve Bank in 1921. There was no need for central banks during the period of the classical gold standard from 1821 to 1914. Money was a simple object: gold or silver. The first of these private banks, the Cape of Good Hope Bank, opened in 1837. As the country was developed, trade expanded and around 30 private banks sprang up between 1837 and 1882, most of which issued their own paper money. In addition, three large trading houses and one mining firm also issued their own paper money between 1850 and 1860. No need for alarm, this system worked perfectly well. There was no price inflation during the 1800s, and in fact, prices fell in the late 1800s, at a time when international trade was booming and the industrial revolution was taking off. It lifted millions of people out of poverty and a middle class was born. Contrary to the popular opinion among economists today, this system absent of central banking and dominated mainly by private banks did not result in runaway inflation. The reason for this is simple. One South African pound in 1820 could buy you the same amount of gold or silver as it did in 1914. For over a century, we had what you would call, “Sound Money.” It was remarkable, and it gave rise to the industrial revolution, as well as international trade and globalisation. Governments did not meddle with the system, as they did not control money. Money was born of the free market. People from all corners of the world were able to do business with each other, accepting for payment money that was accepted, understood, and used, everywhere: gold and silver. Kurt Schuler, a Ph.D economist from John Hopkins University and economist at the US Treasury department, has provided a useful reference of the history of South African monetary systems. 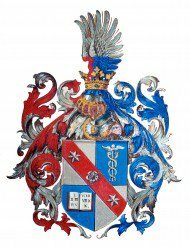 He notes that from 31 May 1910 to late December 1920, South Africa had “free banking”, i.e. there was no monetary authority in South Africa. As already discussed, there were “multiple note-issuing banks” which means there were competing notes in circulation unlike today’s literal ‘monopoly’ money – only one currency allowed. There was no central monetary authority in South Africa during this period. That these gold certificates were not convertible into gold, meant it was issuing a bank note free of the underlying real money in the economy, gold and silver. From 30 June 1921 to present, the only legal issuing authority of money in South Africa has been the Reserve Bank of South Africa. The control of money had been nationalised, and the value of the money we use was no longer fixed to something substantive that was worth its weight in gold or silver, but could be manipulated and changed by politicians as they saw fit. After the Bank of England finally cut the £4.50/oz link of the pound sterling with gold in 1931, the value of the South African pound was also cut from the value of gold. Following WWII, and the introduction of the Bretton Woods system in 1945, global central banks linked the value of their currencies to the US dollar, which in turn was pegged to gold (in principal, but this did not hinder excessive dollar printing). Global currencies were now fixed to the US dollar, and the US dollar was ‘fixed’ to gold. The dollar supposed to be as good as gold, during this period. The key difference now, however, was that only governments/central banks could exchange their dollars for gold. The public was cut out of the gold loop. From 1945 to 1968, the American government proceeded to create more paper dollars relative to the gold at its disposal, and as foreign governments realised this and began to exchange their dollars for gold, the US government was forced to end the US dollar’s redeemability in gold. President Richard Nixon did this in 1971. The final link between all paper monies and gold was cut. Central banks and governments were now able to print as many bank notes as their hearts could possibly desire. The public was placid and unaware that governments had completely nationalised the money supplies of their respective nations. There was no market process that could restrict the amount of bank note printing such as there was from 1821 to 1914. Legal tender laws stamped out any remnant of dissent among those who wished to return to market-based money. 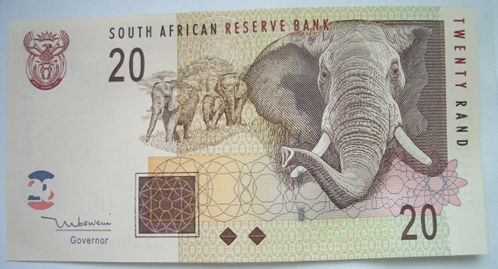 Pick up a Rand bank note today, and you will find no reference to what it actually is. There are no promises to pay the bearer anything. Its value is not tied to anything, and there are no restrictions as to how many Rands the Reserve Bank may create. In the past, this was restricted to the amount of gold used as money. Today, there are no such restrictions. The shackles on money creation have been removed, and the Reserve Bank can now create as much money as it wants. South African Reserve Bank Twenty Rand - "..."
At the start of the year 1966, there were 4.9 million Rands in circulation in South Africa. By the start of 1973, this number had doubled to 10 million. By October 1977, the number of Rands circulating in the economy had doubled again, to 20 million. Since its early years, the Reserve Bank has printed and printed and printed ever increasing amounts of money. By 1990 the number of Rands in circulation had increased to nearly 150 million, by the start of 2000 to 480 million, and to 2,100 million at present! That’s a quadrupling in the past decade. 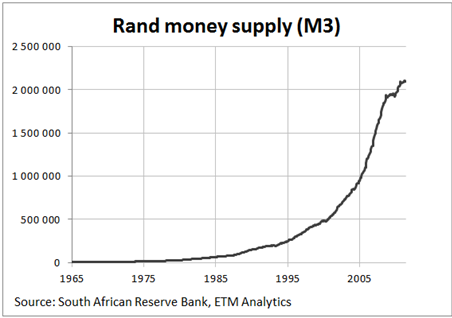 The number of Rands circulating in South Africa has multiplied 440 times since 1965, which is an increase of 44,000%. While the quantity of Rand in circulation has increased exponentially, the quantity of gold ounces in circulation in the world has only increased at the steady rate at which mines can unearth more gold from the ground: much slower, at an approximate rate now of around 1% per year. As a result, the value of paper money has fallen dramatically against gold, as the chart detailing the price of gold shows. 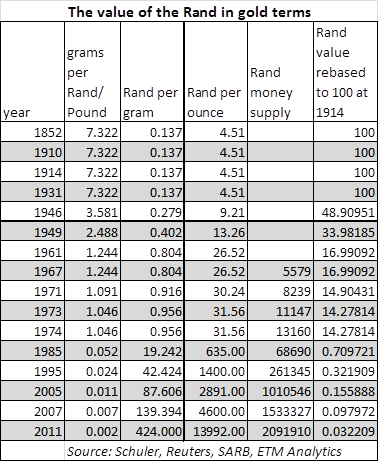 Where an ounce of gold was worth 4.50 South African pounds from 1821 to 1914, and following the debasement of paper money by central banks during WWI and WWII, the South African Rand price of gold was fixed just below R30 in 1971. Since the issuance of bank notes was completely cut from gold in 1971, money printing has become a serious business in all corners of the world, and as a result, the price of gold has climbed to R14,000 per ounce of gold today. Whereas the South African pound was worth 7.3 grams of gold for a century from 1821 to 1914, the gold value of the South African pound fell to 1.2 grams at the time of the introduction of the South African Rand in 1961. Since then, the effective gold content of the Rand has fallen even more dramatically, to 0.002 grams per Rand today. As the historical data shows, it is not the value of gold that is rising per se, but rather that the Rand is being systematically debased against gold. Each new Rand that is printed by the Reserve Bank dilutes the effective gold content of each Rand in existence. The Rand becomes worth less each year. As long as the Reserve Bank continues to create new Rands and boosts the money supply, the gold content of the Rand will continue to decline. 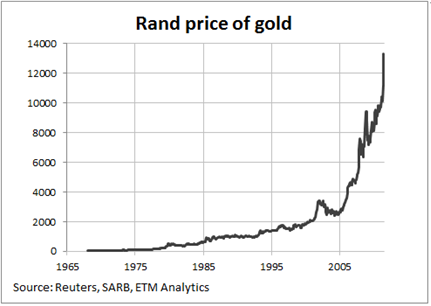 This means that the price of gold in Rand terms will continue to increase for as far as the eye can see. 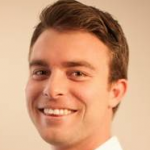 Chris Becker is a Market Strategist at ETM Analytics. Send him mail, or follow him on twitter. Towards the latter part of this period the link to gold was more in principal than in practice, and the world had actually moved onto a dollar exchange standard which saw the dollar backed by gold and everything backed by the dollar. Sterling was also debased against gold during the first half of the 20th century. What happened to the process that effectively ‘contracts’ public/private debt? When gold was removed from legal tender, the south african treasury became obligated to provide a ‘remedy’ for settling debt (set-off). educated African, i think they ought to include this in the current education curriculleum, the history of the monetery system and its implications. This article has opened my eyes. Who currently prints the Mandela Rands in circulation??? All money is created from debt! There are three types of money in our economy. 1) Notes and coins +-4% of our money supply. 2) Digital money. The bulk of the money. 3) Inter bank transfer money. Not accessible to the public. banks use it to settle their accounts with each other. The only way you can get more money is by creating more loans! Well said, honesty is a wonderful experience ! Just read this article and have several questions: is it then true that the money in circulation has been “nationalised” (whatever that means) and the South African Reserve Bank – who is responsible for printing and distributing the money – has been “privatised”? If so, how is this possible? good day, my question is when did the Republic of South Africa go bankphupt? in what year? (when they left the gold statndard and used bank notes backed by nothing)? After the kruger rand was taken away.